Bell Plantation has invented “powdered peanut butter”, that has 85% less fat than regular peanut butter per serving and about a fourth of the calories. It’s made with “premium quality peanuts that are slow roasted and pressed to remove fat”, but still has the same consistency as full fat peanut butter. It, of course, is also all natural and preservative free. All you have to do is measure out 2 Tablespoons, mix with 1 Tablespoon on water, stir and enjoy. But that leaves a peanut butter fanatic like me to wonder…too good to be true? Well. I absolutely. freaking. LOVE this stuff! It comes in a screw top jar and upon opening it, there is a brown/tan powder that certainly smells like peanuts! I measured out 2 tablespoons, put it in a little dish, and put one table spoon of water in. I mixed it up, and it was a little thick, so I added a bit more water. You have to play with it to get the consistency you like, I like my pb to be slightly thick but still creamy. I dipped my knife in to taste it and it was really good! Now of course, it didn’t taste EXACTLY like peanut butter, but it was very close! It has a roasted peanut flavor, slightly slightly sweet, and spreads very nicely on bread. It’s creamy and just delicious! I used it several times, and here are the best combinations I came up with. 1. PB2 & Apple Butter Sandwiches (courtesy of Tap’n’Apple Apple Butter and Vermont Organics Spiced Apple Butter). So good. It’s mushy and fluffy and heaven between 2 slices of bread. 3.PB2 and Stonyfield Farm Organic Chocolate Frozen Yogurt. Either sprinkled on the chocolate frozen yogurt or mixed with water and then drizzled on top of it. Yum! 4. PB2 & Maple Syrup/Honey Sandwiches. Enough said. Peanut butter one side, maple syrup/honey the other=love. Standard, classic, but perfection. Goes great together, perfect balance of sweet and savory. Okay, so apparently I like sandwiches, and that is how I use my PB2 the most. How do you use it? 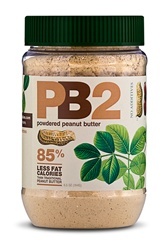 What is your favorite PB2 Combination/Recipe? Leave a post here! The only disappointment to me was that I made a peanut butter and banana sandwich with the PB2, but it unfortunately was not the same as regular peanut butter. It didn’t have that ” so sticky I-can’t-move-my-mouth” feeling that I love with pb&banana sandwiches. PB2 is best used with spreads, in my opinion.I’d love to try the Chocolate Pb2 variety as well. I think that flavor might go better with bananas. Overall, I’m giving PB2 5 stars. It really is excellent!